Blocking bets have their use, but don't make them without thinking about what might come next. Hand analysis: A river spot when a blocking bet made without a plan proves worse than just checking. 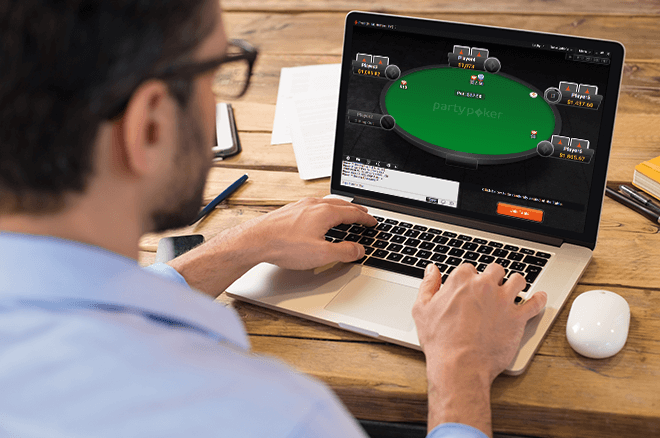 There is certainly a place in postflop poker for the "blocking bet," that small leading bet players sometimes make in an effort to dissuade an opponent from betting larger if they check. But if your opponent already holds the betting lead, blocking bets should be cautiously deployed, and never without a plan for what to do should your opponent not cooperate by just calling. Here's a hand from the 100NL online six-max. tables that shows a player making just such a blocking bet and then finding himself in a kind of no-man's land when his opponent responds with a big raise. Check-Check on the Flop: Who Has the Range Advantage? A regular playing a deep, 300-big blind stack raised 3x to $3 from under the gun and it folded around to the big blind, who called from a starting stack of 143 BB. The flop came and went check-check. First question: Is this a flop that favors under the gun or the big blind? On the one hand, we might say that the big blind has more 5-x type hands in his range. But on the other, UTG has a higher concentration of strong and made hands. Even UTG's misses, like K-J suited, have something going on this board. So for the UTG player to elect not to bet the flop indicates, typically, some sort of showdown value — a hand that doesn't need too much protection, like J-J or perhaps Q-Ts. For every 5-x hand the big blind might defend with here, he has a 7-x hand that whiffed. And an 8-x and a 9-x and so forth. He will have missed the flop quite often. Because of UTG's range advantage, we should assume the pot is his for the taking on the flop. But because he did not take it, he is very likely holding something better than nothing. The turn brought the , making the board . The big blind took the invitation with a $5 bet. Suddenly under the gun woke up to raise to $17. With the raise, UTG is now representing a very narrow band of hands — T-T and Q-Q namely, with the occasional 5-5 and A-5 that did not elect to bet the flop. Because he raised preflop from under the gun, there should only be two combinations of A-5 possible (the remaining suited ones, spades and hearts), and there are only 7 total combinations between Q-Q, T-T, and 5-5. The board is fully rainbow on the turn, so the only draws that could make sense for UTG to bluff are straight draws — A-K, A-J, K-J, K-9, J-9, or 9-8. Some of these are quite unlikely. E.g., would he really raise UTG with K-9? Would he check the flop with 9-8? Could he not just call the turn bet with A-K or A-J and see what develops on the river? The big blind just called the raise, which is what he should do with his whole continuing range. Three-betting the turn is fraught with danger for the big blind, whatever under the gun has. He will still have 7 combinations of full houses or quads, meaning his turn raising range is protected from frequent three-bets. That said, if under the gun is bluffing now, the big blind should be calling to let him bluff again on the river. If the big blind were to throw in some three-bets here, one would expect them to be with 9-8 or J-8-type hands that cannot call and check the river from out of position and hope to win at showdown. The river card was the resolutely insignificant , making the final board . The big blind almost checked, but instead he disrupted the betting flow and led out for $21. Immediately he was shoved on by UTG for a whopping $102 more, effective. There are almost no hands that big blind could have that would like to see this sequence of events. Only 5-5, T-T or a Q-Q that he did not three-bet, or perhaps one of the two 5-3 suited combinations that outdrew A-5s on this river. Most of the big blind's range consists of Q-x-type bluff catchers. So when he chose to lead out with this blocking bet, actually he is leaving these hands hanging out to dry. When our opponent makes a big move, we should assess the strength of our hand relative to what they are representing. Under the gun is representing A-5 or better with the river shove. Even 6-5s might be a thin shove here from his perspective, because he has a strong range and has shown tremendous strength. After painting himself into this corner, the big blind was unable to find the fold button and called with for trips no kicker. Meanwhile, the reason why UTG had woken up on the turn was because he had smashed it — he had . Would under the gun have raised K-K or J-J on the turn? No. With those hands he would have either bet the flop or called the turn. So we know that his turn raising range is polarized, on one end including super strong hands like the one he had (or Q-Q that he slow played), and on the other including odd bluffs like 9-8. There are in fact two distinct disadvantages to making a blocking bet versus such a polarized range. The first, of course, is that we deny our opponent the opportunity to bluff. In this case, UTG would most likely just throw 9-8 or J-9 away when facing this $21 river lead. The second, perhaps graver, problem is we feel obliged to call off facing a value range that entirely beats our hand, when we could have check-called and saved a huge bet. More often than not after we call this all-in we will be scooped by T-T, Q-Q, and the likes of A-5. The times we let them bluff their 9-8 hands for $25 will help offset the times we run into the top of their range. That's the sort of thing that happens when you act without a plan.